Over the last few weeks drivers have faced huge delays at the Channel tunnel due to the migrant crisis in Calais. So far the UK and French governments haven’t found a solution to the number of migrants now arriving at the port. This has had a huge impact on British businesses as they are being forced to find alternative ways of transporting their goods over the Channel. Many companies have had to use aircrafts to transfers essential goods, but even though it is a quick-fix solution, it will cost a lot more money in the long run. What's even more troubling is the fact that the figure could be higher still: Dover claims freight traffic has expanded "considerably" since the study and that it only takes into account ferries, which represent 63% of Channel crossings. The real figure could be as much as £160bn, which would equate to £440m a day in lost trade. The costs calculated don’t even take in to the consideration the strain on public services. 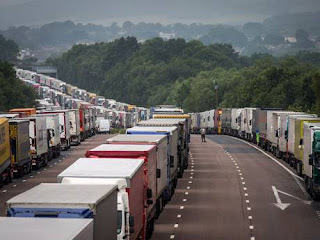 The BBC says Operation Stack has so far cost Kent Police around £700,000, while the Government has said it will spend up to £7m improving security around the tunnel to deal with migrants attempting to illegally enter the UK. There is a center for Car Service Dublin and it has gained a lot of popularity because of their best customer services and also in budget friendly cost.